Colorado Peak Politics | JUDGMENT DAY: Will Democrats Pass The Shotgun, er, Magazine Ban? JUDGMENT DAY: Will Democrats Pass The Shotgun, er, Magazine Ban? Today at the Capitol it’s Judgment Day for Democrats — do they pass the magazine shotgun ban and assorted other pieces of controversial gun grabbing legislation, sealing the fate of a number of swing seat Democrats, or do they listen to the grassroots wave that has spread across the state demanding they respect the 2nd Amendment? 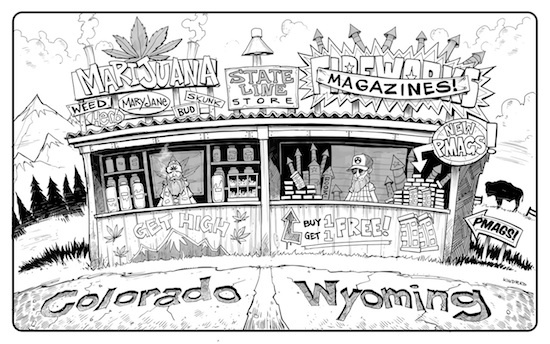 Do they brand us as the pro-pot, anti-gun state that leaves us looking more California than Colorado? Colorado Democrats won big in November 2012, just as they did in November 2008. The question now is will they overreach as Obama did with Obamacare, causing a political backlash that torches the electoral victories they won? It’s almost like deja vu all over again. Are Democrats simply incapable of not overreaching? « TODAY AT THE CAPITOL: How Are You Showing Your Support for the 2nd Amendment?